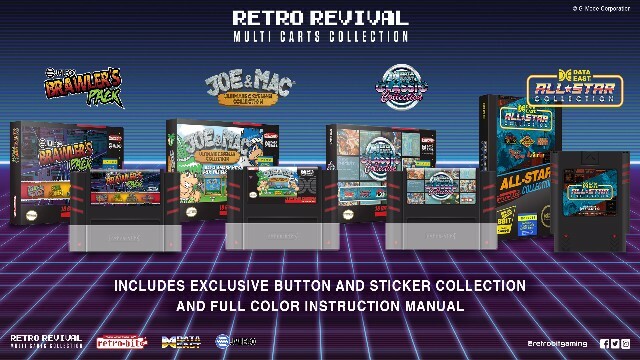 Retro-Bit is releasing a new line of multi-carts featuring various old shcool games originally released on the NES and SNES. These include Ring King, Joe and Mac, Magical Drop III, and The Peacemakers among many others. You can get more information on this in the press release below. For retro gaming fans looking to build their collection in one easy step, Retro-Bit® has provided the perfect solution – Multi-Cartridges! Retro-Bit® has partnered up with legendary game publishers Data East and Jaleco to release new cartridges loaded with officially licensed popular games. Available in time for the holidays this December, each cartridge is compatible with the original SNES® ($34.99*), NES® ($29.99*) and select Retro-Bit consoles. The cartridges are accompanied with an exclusive button and sticker set along with a collectible retail box, full color instruction manual and protective hard dust cover**. Enjoy some of the very best games from the Data East library with the All Star Collection cartridge. Published by Retro-Bit® for your NES® consoles, this 5-in-1 cart compiles a must have list of retro classics. The Classic Collection from Data East brings you a brand new 5-in-1 cartridge for your original or 3rd party SNES® console. Published by Retro-Bit® with you in mind. Stop searching, sit back, and enjoy these classics on one cartridge. All 3 smash hits in 1 compilation for the first time! Includes all 3 Super Nintendo® / Super Famicom Joe & Mac games – Joe & Mac: Caveman Ninja, Congo’s Caper™ (Joe & Mac Sequel) and Joe & Mac 2: Lost in the Tropics. Joe & Mac will bring you back in time! Relive the adventure as you travel every nostalgic level and battle enemies along the path. Test your might with the new Jaleco Brawler’s Pack, featuring 4 side scrolling beat em ups on one cartridge. Published by Retro-Bit® and compatible with all original or 3rd party SNES® consoles. Are you up to the challenge? This is exciting news for those of you that are fan of old arcade games from the 80s and 90s. How many of you plan on picking up one of these compilation cartridges?